I like the TV show Glee, but I missed the season finale. Tom thought I should see it, so I found it and watched it. And watched it again. 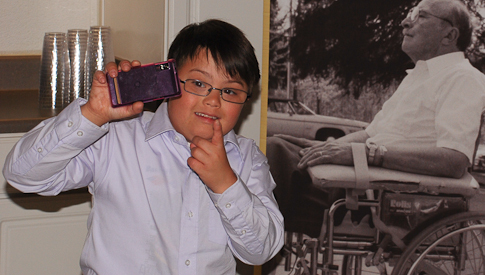 It has been a common assumption that the life expectancy for those with Down syndrome is short. But as the life expectancy for the general population has increased, so has that of persons with Down syndrome. 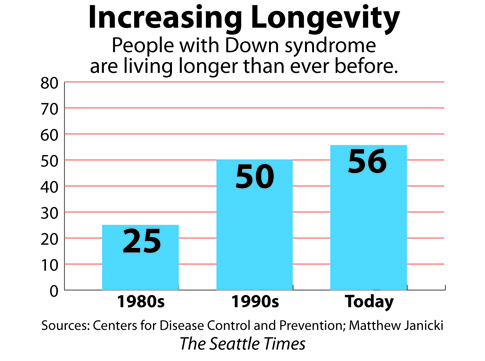 One reference stated that the average life expectancy of individuals with Down syndrome has increased from 9 years in 1929 to 12-15 years in 1947 and 18 years in 1961. The current projection is that 44% will survive to the age of 60 years and 13% to 68 years. As for me, I don’t know how to deal with these projections. Billy is in his 50s and I am in my 80s. It’s a toss up to see who will go first. So like the coach, I don’t know how to deal with it. For now I’m just going to enjoy him. On April 9 Billy, Mary and I spent a delightful afternoon with a group called The Pure in Heart, at Longs Chapel United Methodist Church in Lake Junaluska N.C. This long standing church/community group is led by Jackie Spencer, a former student and dear friend of mine. What a reception we received from the Pure in Heart! Thank you! The Pure in Heart includes persons with disabilities, their parents, teachers, and friends. They welcomed us with open arms (literally), listened to our stories, and shared their concerns and victories. We had revised our presentation to reflect changes in Billy’s life and my awareness of what I have learned from him. We called it Lessons From Billy. Chris, who spontaneously led the group in the Pledge of Allegiance, is a photography enthusiast. A surprise feature was the Pledge of Allegiance, led by Chris, one of the younger members of the group. Following the presentation, we enjoyed delicious refreshments and energetic conversation. A few days later we returned to North Carolina to speak with students and educators at Western Carolina University. Dr. David Westling has invited us to join his students for several years and we always enjoy being there. This time Dr. Valerie Mazzotti welcomed us into her class (SPED 413) for our presentation. Afterwards we were treated with a lovely meal and a conversation full of ideas for the future of education! It is such a privilege for Billy and me to return to a place we worked and loved, to see our old friends and to meet new ones. Both of these events, with unique audiences, illustrated the positive contributions that many people are making to ensure that persons with disabilities have opportunities to develop into happy and productive adults. Thank you, Jackie and David, for your dedication and passion for what you do and for whom you serve, and for your gracious hospitality.